127 mins, colour, German with English subtitles. 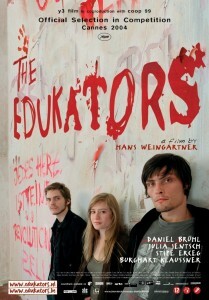 Set in Berlin, the movie tells the story of three young anti-capitalist activists, Jule, her boyfriend Peter and his best friend Jan. The three friends, involved in a love triangle, call themselves “the Edukators” and together raid upper-class houses rearranging the furniture and leaving notes saying “die fetten Jahre sind vorbei” or “Sie haben zu viel Geld” in order to “educate” upper classes.